As Senior Migration Advisor working at UNICEF Headquarters in NY, Verena provides support and guidance to UNICEF country offices globally on policy and programmes for refugee and migrant children. Verena also leads on UNICEF’s global engagement with the Global Migration and Refugee Compacts, working in partnership with civil society organization, UN agencies and other stakeholders. Prior to this, Verena spent five years as Senior Policy Advisor in the UNICEF EU office, where she focused on child rights mainstreaming across EU internal and external policies and programmes, scaling up and leveraging EU investments for children. Before joining UNICEF, in the years 2010 and 2012, Verena authored three UNICEF reports on the experiences and impact of repatriation and returns on vulnerable children, including on their psycho-social health. From 2008 – 2012, Verena provided strategic advice to the Kosovo Ministry of European Integration and the mayor of the ethnically divided city of Mitrovica, focusing on the rule of law, visa liberalization, local economic development and interethnic reconciliation. 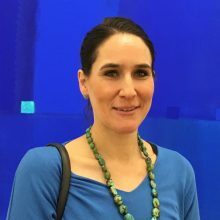 In the years 1999-2008, as co-founder and Senior Analyst for ESI, an independent policy think tank, Verena coordinated ESI’s research and campaigns in Turkey and the Balkans. In 2008, ESI produced the award-winning documentary film series ‘Balkan Express: Return to Europe’, seen by more than 2 million viewers. Verena is also co-author of the first English-language guidebook on Kosovo (Bradt Guide), Yale World Fellow and Young Global Leader of the World Economic Forum.